Neem blossoms are especially used in a special dish called neem patchidi - a preparation with neem blossoms and curds during Tamizh New Year's day which generally falls on 14th April. It is supposed to do a world of good for our body's digestive system but as kids we used to hate it! Quote from Koeisha & Co.
Toothpick was introduced into Japan in 584 (Nara period). It was brought in with Buddhism via China and Korea. Buddha (500BC) had originally taught his disciples to clean their teeth with tufted toothbrush. In India they used twigs from Neem tree and others. They called them [danta-kashuta] in Sanskrit. [Danta] is the origin of dental and [kashuta] means twig. As they did not grow in China the poplar was used instead. The Chinese and Japanese word for poplar is YO and for branch JI, hence the name YOJI or TSUMAYOJI for toothpick in Japanese. Even now in India [Danta] means 32, the number of teeth. In rural Kerala it is a common phenomenon even now, to use fresh, green twigs of the mango tree, along with neem (vembu) and babul. The neem tree could have been designed by a celestial committee (maybe it was). A collaboration of genetic engineers, chemical engineers, pharmacists, agronomists, and dieticians could not have produced a more interesting, and some say, valuable, plant. I'll let you decide after reading this brief overview. Azadirachta indica is "tailor-made for combating the serious problems confronting mankind today" says the Neem Foundation. " Studies through appropriate scientific channels are increasing and verifying the traditional uses and are finding even more uses for neem. Although major studies to conclusively prove neem's effectiveness are limited by financing and the general lack of knowledge in the West about it, preliminary studies suggest exciting uses for neem." From the very beginning of recorded human history, people have used the mysterious neem tree. Today, rural Indians call this tree their "village pharmacy" because it is said to "cure" diseases and disorders ranging from bad teeth and bedbugs to ulcers and malaria. The seeds, bark and leaves contain compounds called limonoids with proven antiseptic, antiviral, antipyretic, anti-inflammatory, anti-ulcer and antifungal uses. Neem has a cousin that is a very familiar tree in the United States called the Chinaberry. Many North Americans are familiar with the abundant Chinaberry tree, Melia azedarach . Also known as umbrella tree, this naturalized western Asian tree is a colonizer of disturbed sites throughout the South. It can be messy with surface roots, brittle wood, and toxic berries. However, it has an ability to grow in hostile sites and produce desirable shade. Neem, on the other hand, is a sturdy, broadleaved evergreen. In the seasonally dry hills of central India, Azadirachta indica , is very much in existence with the people and animals in villages and along roadsides. It will defoliate during periods of extreme drought or freezing temperatures. Native to the dry forest areas of India, Pakistan and Sri Lanka, neem thrives in the dry areas of the tropics and subtropics. Mature neem trees are capable of withstanding mild freezes and can be grown in some of the United States south, along coastal California to San Francisco and on the East coast as far north as central Florida. In freeze zones they must be grown potted and taken in during cold snaps. Used as a vaginal lubricant, neem oil was up to 100 percent effective in preventing pregnancy. An active ingredient in neem leaves, called irodin A, is toxic to resistant strains of malaria. Neem (Azadirachta indica, syn. Melia azadirachta L., Antelaea azadirachta (L.) Adelb.) is a tree in the mahogany family Meliaceae. It is one of two species in the genus Azadirachta, and is native to Bangladesh, India, Myanmar, and Pakistan growing in tropical and semi-tropical regions. Other vernacular names include Azad Dirakht (Persian), DogonYaro (Nigerian), Margosa, Neeb (Arabic), Nimtree, Nimba (Sanskrit), Vepu, Vempu, Vepa (Telugu), Bevu in Kannada, Veppam in (Tamil),arya veppu in malayalam and Indian-lilac. In East Africa it is also known as Mwarobaini (Kiswahili), which means the tree of the 40; it's said to treat 40 different diseases. Neem oil is used for preparing cosmetics. Our Andhra festival is known by different names in different states of India like “Gudi Padwa” in Maharastra and “Ugadi” in Andhra Pradesh and Karnataka. Whatever the name this festival takes in different regions, it heralds the dawn of Vasanth Rutu (Spring Season), which is considered the first season of the year (Chaitra Maasam). Ugadi to the Telugu speaking people marks a beginning of a new year in which nature is in full bloom, symbolizing regeneration and celebrating the season’s freshness. 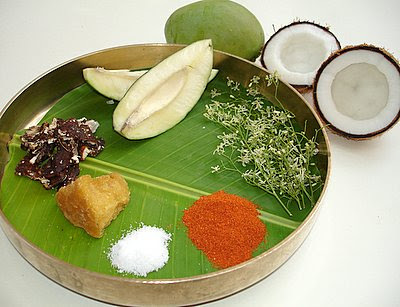 is a special preparation prepared in every Andhra home on Telugu New Year’s day. Its made with fresh tamarind, jaggery (panela), fresh mangoes and neem flowers (margosa). One can add sugarcane, coconut and bananas also. The sweetness of jaggery, the sourness of tamarind, the bitterness of neemflower and the pungent flavor of the green mango skin, spice of the chilli powder, raw tender mango’s taste and lastly salt form the shadhruchulu or six tastes of the sauce. Check this LINK for many more seasonal Indian dishes! (नीम Neem (Hindi),(نیم Neem (Urdu), Nim (Bengali), ಬೇವು Bevu (Kannada), வேம்பு Vembu (Tamil) ) is a tree in the mahogany family Meliaceae. It is one of two species in the genus Azadirachta, and is native to India, Pakistan, and Bangladesh growing in tropical and semi-tropical regions. Neem trees also grow in islands in the southern part of Iran where it is called "Cherish" چریش" in Persian. Its fruits and seeds are the source of neem oil. scattering its blossoms . . .